I completed my first moebius experiment/scarf. I think it's too long and too narrow. (Go read my previous post and laugh. I won't mind.) I'm not surprised it's too long because I didn't bother to swatch. I just really just wanted to get something on the needles and see if I could figure out how to make the "magic" happen. 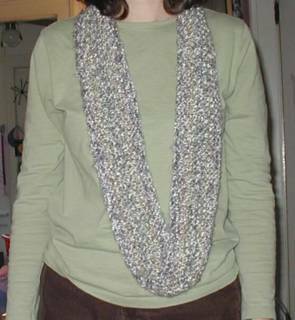 And, indeed, I ended up with a one-sided scarf with no grafted edges. Magic. Because I used yarn I don't even like much (Lion Brand homespun), this scarf will probably end up in my daughter's dress-up box. But--I am already plotting my first "real" moebius project. I need to find some other folks who are interested in this technique and start a "moebius-along."